So we continue this lovely retrospective with the movie that spurned my desire to create it in the first place, Starship Troopers 2: Heroes of the Federation. Out of the four movies in the Starship Troopers franchise, this detestable film is not only the least like the source material, but almost seems to try to go out of its way to be a disgrace to the Verhoeven 90’s cult classic. Some might say that is unfair of me to say, seeing as how this film was created on a $7 million dollar budget, nearly $98 million less than the original movie, but that should still not excuse it from making a movie that would barely be passable if it were its own standalone title. 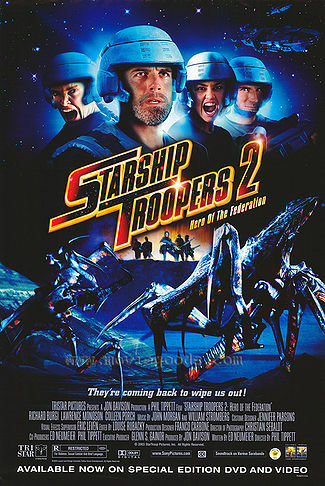 Starship Troopers 2 was created in 2004, nearly seven years after the original movie. by this time, the original film had started to receive its cult status title and critics and fans began to reassess the movie and its merits. Of course when this happens, someone has to come around and take advantage of it. Those people being Edward Neumeier, John Davisson, and Phil Tippet. All three of these men had worked with Verhoeven in the past with movies such as Robocop and the original Starship Troopers. The three would pick up the series while Verhoeven was off doing more productive things with his career. So with a fraction of the budget, the three men set forth to resuscitate the series with all three producing the film, Neumeier writing, and Tippet directing. The combination of the three gave us… Well the abysmal shell of the first film’s former self that we see before us. On an arachnid infested planet, our unfortunate protagonists find themselves as the few survivors of a platoon that was overwhelmed and forced to retreat. With their coms man killed in action, the survivors take refuge in an old outpost guarded by an electric pulse fence. The surviving members find out that the outpost is also the home of a disgraced soldier named VJ Dax (Richard Burgi) who killed his superior officer and left to die in the furnace. As Dax is released he quickly uses his charisma to take command of the group. All the while as they take shelter, a private Lei Sahara (Colleen Porch) keeps having psychic visions of destruction and death much to the anger of Lieutenant Dill (Lawrence Monoson) who dislikes the psychic due to her inability to control her psychic powers since she hit puberty. Everything seems bleak until the arrival of their commander, General Shepherd (Ed Lauter) who were rescued by three mysterious soldiers. Together they get instruments up and running and call down a drop ship for rescue. But not everything is as it seems as the three newcomers have been infected with a new kind of bug that takes over the human’s mind and turns them into their puppets. Things take a turn for the worse as the marines quickly discover that if these bugs were to reach earth, it could compromise the entire human race and so on and so forth. I will give them credit where credit is due. Considering the fact that you need to make a sequel to a movie but you are only working with a tiny fraction of what you had to work with for the original series, these guys worked with what they had to work with. They downsized the grandiose nature of the series and were able to tell a story in the same mythos on a fraction of the budget. Granted, it did not work, but this same formula would come back to their advantage for the third installment of the series, Marauder. So even though it was a failure here, it does show that the crew was on the right direction of downsizing the series into a more manageable budget. You couldn’t get anyone to return for this thing? Okay, I do understand that Casper Van Dien, Denise Richards, and Neil Patrick Harris probably had better things to do with their time than to star in a sequel to a thought to be one-off film (although Van Dien would return for the third movie). But you couldn’t get anyone?! Not even Jake Busey to show up? It isn’t like the guy had a lot going on in 2002-2004 with movies like Christmas with the Kranks and The Hitcher II on his stellar oeuvre. You really couldn’t get him back? I do hand it to them that they made an attempt to retrieve Clancy Brown, the man who played Drill Sergeant Zim, but since he was too busy with another film, the character was rewritten into Dax. But without any returning characters, this film does not feel like a Starship Troopers movie, but a shottely put together hodgepodge with the Starship Troopers name attached to it. So let’s talk about what made Starship Troopers great again. You had some stellar visual effects that rivaled some of the best of the time. You also had great characters that seemed to fit the mythos and ones that you not only wanted to see succeeded, but watched evolve before your very eyes on the screen. You also had the fascist undertones and the cheeky newscast asking if you want to know more laced with good ole propaganda. So for the sequel, let’s take all of that and throw it all out the window to tell what is by all accounts a mix of a slasher, kill off one by one movie in a flimsy shell of the Starship Troopers mythos. Now granted, due to the lack of budget, you cannot create a $100 million dollar spectacle on a $7 million dollar budget, I’m not saying I was expecting the exact same movie. But you can still hold true to the source material and create a decent story with the mythos even given the limited means to work with. 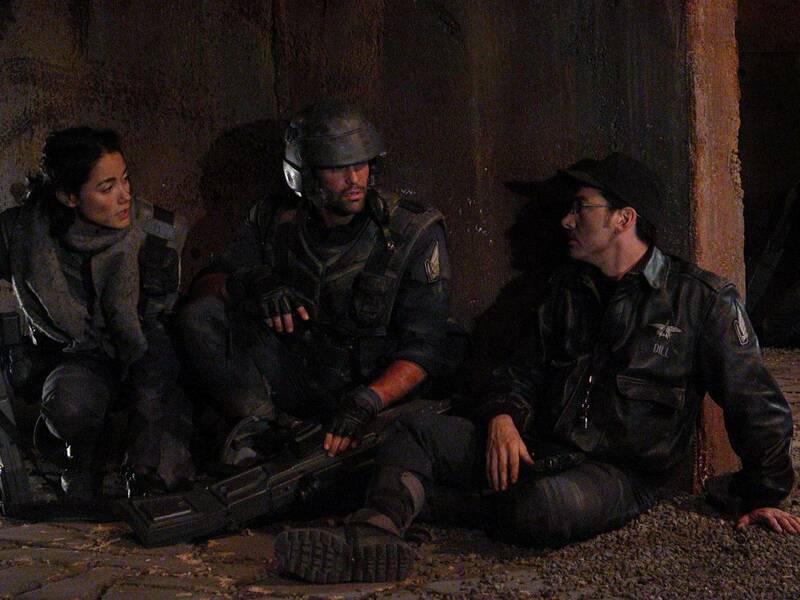 Just look at the other sequel Starship Troopers 3: Marauder for proof of that. But when you strip away the intelligent political context, take the fun characters that seem to blend in with the world provided, replace them with nothing more than loud grunting ARMY YAY stereotypes, take tongue in cheek shoot-em up fun, and replace it with a standard 2000’s people trapped in a small confined space and slowly killed off one at a time, you are bound to have a piss poor film on your hands. When it comes right down to it, Starship Troopers 2: Heroes of the Federation just isn’t a Starship Troopers movie. It strips away everything that made the original unique and replaced it with a movie that even on its own would only hold up as a sub par 2000’s science fiction horror film that you would see on SyFy. This movie is almost unwatchable. If you are a fan of the original, you will be screaming at the television screen as they take the franchise and rip away everything that is likable about it. If you are not a fan of the series and you just see this and decide to watch it, you will be underwhelmed by a very predictable story and having a strong desire to know more of the mythos as you have these gigantic bugs that barely get any screen time. As far as the Starship Troopers franchise is concerned, this is most likely the worst of the lot. Thank you for reading and as always if you enjoyed this review then please like and subscribe for more. Also return soon for the third installment of the retrospective, the much better Starship Troopers 3: Marauder.